Sunday morning I woke up, nursed Isla and then got ready for church. We were running late (per usual) so I threw this dress on that I bought right before I gave birth to Isla (I was a little excited about buying non-maternity clothes again). About two hours into church Isla got hungry so I headed to the mother’s lounge to feed her. The moment I sat down I realized that there was no possible way to feed Isla in this dress- other than completely taking off my dress. Needless to say there was NO way I was going to strip down in the mother’s lounge so I gathered up my stuff and ran home to feed her. Major mom fail on my part, Isla was not very happy with me by the time we got home and actually sat down to nurse. There are so many things that go through my mind as a new mom and now remembering to wear something that I can breastfeed in is one of them! Happy Friday, I hope you all have a great weekend! She does look amazing!! No worries, Rach! It happens! That dress is beyond gorgeous! So pretty and you look amazing! I am really sorry that this dress is not good for feeding your baby but on the other side, when Isla grow up you can wear this dress without any worries about it. The dress is very beautiful and tiny and gentle, and it really suits your personality! OBSESSED with your glasses! And omg, too funny! It’s so crazy how you now have to think about what you’re going to wear out in a totally different way now! They dress looks beautiful on you, despite not being practical for nursing! Haha, thanks for sharing this sweet story! Love your blog! Have a great weekend! Well, it might not work for nursing, but it looks very pretty on you! you look amazing! dont beat yourself up, things happen! I feel that is one of those great first memories! You look gorgeous in the dress! You look beautiful! I’m sorry the outfit didn’t work for breastfeeding but hope you enjoy wearing this look in the future! Such a gorgeous dress, too bad it’s not practical while nursing! I love how you paired it with the gold belt and jewelry from your collection! It’s a fabulous summer look! Happy Friday! Aw! Well the dress is gorgeous and I’m sure there will be plenty of opportunities to wear it when Isla isn’t breastfeeding! Sorry about the fail but this dress is gorgeous and you look great! Oh no!! Besides the dress fail, it is a pretty dress and I can totally see why you’d be excited to wear it! What a pretty dress, you look great! That’s such a pretty dress! At least you’ll be able to still wear it when she’s older and not have to worry about being able to feed her! Well you look amazing in that dress! That dress is so pretty though- romantic and breezy for summer! Just one of the many things that happens when you are a mom. Hope you find a few more feeding friendly dresses. Oh darn on the fail but the dress is so pretty! Awww don’t beat yourself up. I’m sure many other mom’s have had many mom fails too. At least the dress looked pretty, and Isla eventually got fed! Even if it might not be the most practical dress,it sure looks super nice on you. Love this dress with the belt, beautiful style! But you look gorgeous!! :) It gets easier, promise! You look so beautiful, Rach. You were glowing before you had Isla, but now you just look ethereal. Happy looks amazing on you (so does the dress btw even if it was a nursing fail). You’ve made me look forward to having children. Oh you poor girl! It’s not a major fail as much of a fact that slipped the mind! So sorry this had to happen! Such a funny story – at least you looked good! Love the dress and I hope you have a great weekend! Aww sorry that fiasco happened! But this dress is gorgeous! Sorry about the fail, but your look gorgeous! That dress is stunning! this dress is absolutely gorgeous! too bad it doesn’t work well for breast feeding! but beautiful all the same! That story is really funny! I can totally see neglecting to think about what’s stylish but also functional. Either way, the dress is really cute! I’ve had a few of those moments several times. Its so stressful at the time when you baby is freaking out and your thinking, I cant strip down. That dress is gorgeous though! 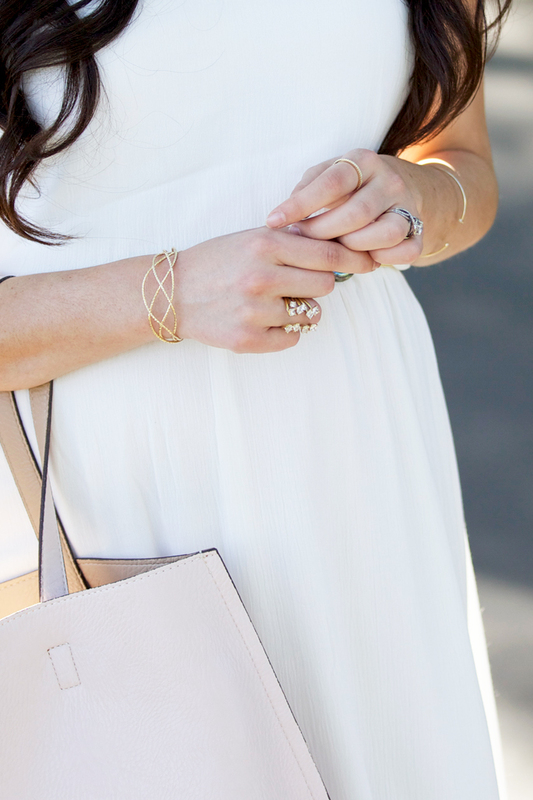 Love the all neutral and feminine look! may not be good for nursing but I love your dress! Oh Rach! I’m so sorry! I do remember those days of having to breast feed and you have to be so careful about what you wear. When you’re a new Mom, you just do the best you can-especially because you’re running on lack of sleep. But you look absolutely gorgeous in these pics! I love the braided belt you’re wearing. That tote bag looks great with everything ( I have a similar one from Old Navy). Your hair is getting so long and looks so beautiful! Haha! Thank you for this story… I can totally appreciate how you must have felt. I just had my first baby on April 27th (it was so fun to be pregnant “along side” you!) and am also breastfeeding. It’s tough to remember that you have to dress for it, too! I feel like each time I take my son anywhere, I forget something essential. It’s a learning process, that’s for sure! Really pretty dress even if not very breastfeeding friendly. You look gorgeous in it! Please share your routine for keeping your lips so smooth! White and gold always make a stunning combo. You look gorgeous! You look absolutely gorgeous! Love the dress & I’ve totally been there too w/breastfeeding fails because of the wrong dress. The good news is it’s such a classic look you can wear it again when you aren’t nursing as frequently or when she is older (maybe great for a date night). Loved loved loved the recommendation on your last post. I ordered two of the Vince dresses (one in each color) as I’m expecting bambino #2 w/in the next few weeks and want to feel stylish when I can! Thank you!!! I always enjoy your posts. Don’t fret. Unfortunately you will have more fails. But that is a part of motherhood and you learn with everything. People will tell you do it this way or that, but stick to your heart. Your Isla’s momma, God gave you to her. He knows what’s best :) Looking beautiful! I can see that being something I would do, when I’m a mom! You have a passion for fashion :) Can’t wait to see some of your “nursing-friendly” outfits. I saw the title of this post “Major Fail” and then scrolled down to look at all the gorgeous photos and could not for the life of me figure out what the ‘fail’ was until I read your post! Funny story! Creating a whole new wardrobe around nursing can be a bit tricky but breastfeeding is totally worth it. As much as I don’t like this option and it doesn’t sound relaxing, I’ve taken my little one into the handicap stall of the restroom and just stood and nursed her in my arms (usually if we were somewhere and I didn’t feel comfortable nursing in public). Of course that’s much easier to do when they are a bit older and are more efficient (like 5 mins per side vs. 20 mins). I’ve also nursed in the fitting room at Target many times on the bench. ;) The skirt and top idea you had before for church seemed like a good option. Also, maybe blouses with skirts that button down or nursing cami/tanks under a pretty blazer or cardigan with skirt could be a great option for you. I guess it’s trial & error with the nursing attire! Love the simplicity of this look Rach. Our daughters are just about the same age and I’m having the same issues! I was just thinking the other day I should create a line of nursing-friendly, fashionable tops because right now it seems like your choices are either look dowdy and nurse, or look fab and not nurse! Yep – been there and can totally relate! It’s a lovely dress which you will be able to enjoy when Isla is done breastfeeding… of course then she’ll be eating solids and that is nothing but messy! Ah the fun of being a Mama, but I wouldn’t trade it for anything in the world! So much to think about when you have a baby, oy! This a beautiful white dress, those gold bottoms heels are unreal!! Ha! Yes, that does happen! I am on 14 months of breastfeeding and it stinks to not be able to wear certain things. I pump at work and I have stripped down to my skivvies to pump a few times just because I wanted to wear a dress I can’t wear when I have my son. that dress is gorgeous. it may not be pratical right now but at least you look great. You are so pretty! Love how modest, classy, and in style you always are. Such a lovely summer outfit, I love how you styled the white dress! I think these kinds of things happen to every mom. One time I went to the children’s museum after I had just had my second child. I was so worried about remembering all the things that everyone needed, that I forgot to put my nursing pads in- I also had forgotten to bring any with me! About an hour and a half into our fun, I noticed that the front of my shirt was soaking wet!! Luckily I was wearing my baby, so nobody knew except the two of us, but I sure felt dumb, and I never made that embarrassing mistake again! Aww! I’m not a mom yet, but I can imagine your frustration. By the way, I love that bag! Oh dear! I think it’s all a massive learning curve. Don’t worry – you’ll get the hang of it! We love the length of your dress. Midi’s are so hard to pull off but you’ve done it superbly. Sandals look great with the outfit too. Same happened to me when I just had Mason. Being a first time Mom isn’t easy.